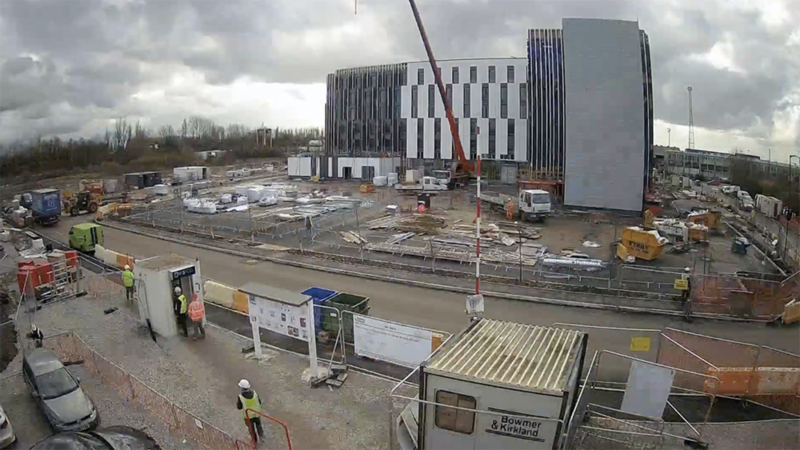 Construction of a new 220 bedroom hotel in TraffordCity is underway and will be the North West’s first ‘modular’ hotel made entirely from shipping containers, with the final batch of “fully dressed” containers already being put in place. The hotel, located next to Manchester’s EventCity venue, is one of the first Holiday Inn Express ‘Generation 4’ in the UK to be built using this new ‘modular’ construction technique. It uses purpose-built steel shipping containers complete with fully finished interior fixtures and fittings, incorporating full height windows, carpet, wallpaper, ceiling and light fittings all of which are installed before being delivered to site. The modules, weighing approx. 20 tonnes each (equivalent of eight Land Rovers), are individually stacked, with all 220 guest rooms being installed within a 2-4 week period. An external finish is applied to the building once the modules are in place to create an attractive appearance. Tower Hotel Management, part of the Peel Group, has been awarded the management contract to operate the new super modern Holiday Inn Express hotel at TraffordCity, Manchester. Located on a 1.75 acre site next door to EventCity, the hotel will provide a convenient stopover for leisure and business visitors and, with Peel’s own Tower Hotel Management leading operations, it will create a first-class hospitality service for customers. Peter added: “In a prime location, Holiday Inn Express TraffordCity is ideally suited to serve the huge numbers of both leisure and business travellers visiting EventCity, intu Trafford Centre and the wider TraffordCity area. The planned arrival of the TfGM Metrolink line in several years’ time will only increase the hotel’s appeal. The hotel will be one of the first in the UK to offer the Holiday Inn’s latest ‘Generation 4’ guest experience, with new room designs developed to meet the needs of today’s ‘Smart Traveller’, plus a new food and beverage concept. It is planned to open June 2017. As well as being on the doorstep of intu Trafford Centre and EventCity, Holiday Inn Express TraffordCity will benefit from the surrounding 3.5 million square feet of retail, leisure and commercial space which forms TraffordCity and includes some of the most successful and high profile leisure brands in the UK such as The Chill Factore, Play Factore, Airkix, David Lloyd and DW Sports. The hotel is the first project by the joint venture, Topland Group, Marick Capital and Mill Lane Estates. Architects for the project are Chapman Taylor and the main contractors are Bowmer and Kirkland.